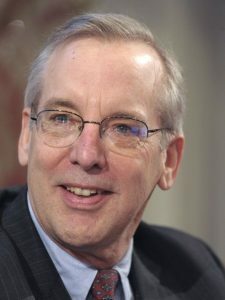 William Dudley, president of the Federal Reserve Bank of New York, gave a superb speech in London today about corporate culture and how to push the banking industry to higher standards of good conduct. Anyone who cares about corporate culture, regardless of whether you’re in the banking sector or not, should give his comments a read. Dudley was speaking at a meeting of the Banking Standards Board, a group formed several years ago to explore standards of behavior, or the lack thereof, at financial firms. The BSB published a benchmarking report last week on the state of corporate culture in banking (spoiler alert: not good). Dudley picked up on those findings to discuss three steps he says are crucial to improve corporate culture. His recommendations are straightforward. First, a bank must decide on its purpose and core values—or, as Dudley put it, “What are you for?” Once a bank identifies its purpose and values, you can measure how well the workforce is striving to achieve that purpose (and how well your bank compares against peers on that score). Then, after the bank determines how far it is from its purpose and values, it can engineer its incentives so employees work harder to achieve those goals. Sounds easy, doesn’t it? And like I said, compliance officers from any walk of life can take those three steps and apply them to your own business. They’re not exclusive to banking. The BSB survey, however, shows how difficult achieving all this really is. More than 80 percent of the BSB’s survey participants said they understood their bank’s core values and appreciated them. Only 65 percent, however, said no conflict exists between those values and how their banks conducted daily operations. Fourteen percent said there is conflict between their bank’s stated values and its daily culture—“with this being more marked in systemically important institutions,” the report noted with typical British understatement. Translation: bigger banks have bigger problems with their culture. I suspect that point isn’t exclusive to the financial sector either. So how do we get ahead of the culture problem? Look at what Dudley had to say about the purpose of banks. They exist to facilitate the exchange of capital; to be a conduit between people with money to spare and people who need it. Banks support well-functioning capital markets, and serve as custodians of a customer’s wealth. Dudley is correct. Companies of all stripes need to make long-term stability the foundation of their culture, and then construct their employee incentives to foster that goal. We should have no illusions about how hard that is. The market pressures businesses to deliver results every day, and as a consequence, senior executives pressure lower employees to deliver results, too—even to the point of committing misconduct. That’s the conversation compliance and audit executives should have with your boards about corporate culture. The threat to good conduct is pressure to deliver short-term results even at the expense of long-term stability. To fight it, a company must build its culture around that core value of long-term stability, even if that means telling short-term players to cool their heels. Again, I don’t believe many people would disagree with that concept—but even a casual look at the market shows it to be a rather rare thing. So how do we build a focus on long-term stability? Meanwhile, within the company, compliance officers need to work with other Second Line of Defense functions to be sure that incentive compensation drives up commitment to long-term stability as well. I admit that to my reading of Dudley’s speech, he’s a bit light on specific examples of what incentives for long-term stability might look like. And it’s foolish to say, “Kill all performance bonuses” since companies do still want (and need) a high-performance culture. We just need to understand the fault lines that cross over to high-pressure culture—and then avoid them at all costs. Lastly, look again at that Fraud Triangle picture above. 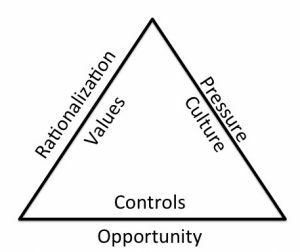 The other crucial leg of the triangle is rationalization, and the bulwark of strong values. We need to appreciate the subtle connections between pressure and culture, and rationalization and values. Most people don’t want to commit misconduct at the beginning. They rationalize their way to misconduct by saying the moral opprobrium doesn’t really apply to them—that what I’m doing isn’t really misconduct in this instance; or it isn’t as bad as people say; or I’ll only do it this once because I must, and then I’ll be a good person again. When someone says, “I’m doing misconduct because I have no choice”—that’s pressure. Pressure leads to the rationalization that committing misconduct is OK. If you foster a culture that resists that pressure, then you drive up the need for the wrongdoer to rationalize his misconduct more. People generally aren’t good at rationalizing. We know misconduct when we do it. Pressure lets us cloak the misconduct more easily, and hide the morally icky part we don’t want to admit. Pull the cloak away, and hugging that icky part becomes much harder to do. That’s where companies need to go: to a world where we pressure people to focus on long-term, stable, ethical conduct. Devise the right incentives to foster that culture, and the rationalizations people dream up for committing misconduct become a lot harder to do.